It’s been a month or so since I bailed on the iPhone and went all in on Google’s flagship Nexus 4. I’ve been keeping mental notes on the transition, and thought it might be useful to others if I sketched out a few observations here. Also, I imagine some of you will have good input for me as I learn to navigate the Android OS – like any new environment it has its share of ticks, tips and tricks that, if you don’t know them, are rather hard to crack. Once learned, however, they are extremely useful. For example, I didn’t know going in that the standard keyboard has a “swipe” feature, which lets you quickly drag your finger across the keys as algorithms figure out what words you are trying to make. It works so well I haven’t bothered to download the alternative keyboards readily available in Google’s (vastly improved) Play store. In fact, overall the text input system of the Nexus is so much better than the iPhone, it makes me wonder what’s wrong with Apple – until, of course, I start to think more broadly about the two companies, and it becomes far clearer. Apple’s ecosystem is the product of a careful manicured, top-down design approach. Google’s is more messily bottoms up. For years, Apple’s devices have been far superior to Android. But the collective intelligence of Google’s approach is starting to lap the fabled Cupertino icon. Which brings me back to the Nexus’ text input. Just as I was starting to use the “swipe” functionality, I noticed the little microphone icon next to the space bar. It’s the same icon that I’d been using in the Google Search app on my iPhone, which worked startlingly well. I’ve found that the Nexus 4’s voice input is close to magic – it’s become a cocktail party parlor trick, in fact. It runs circles around Apple’s Siri – as countless head to head comparisons with friends who have an iPhone 5s has proven. It makes texting and answering short emails almost fun. It’s changed how I think about communicating, for the better. Why is it so good? Because Google is, at its heart, a big data processing and learning machine. Its roots as a search company means it looks for signals inside unimaginably large datasets, and refines its results over and over until it starts to get things right. That’s what it’s done with its voice recognition engine, and it’s paid off handsomely in a software win inside Android. And I believe increasingly, it’s going to be that software+cloud processsing+iteration+UI loop that will mean Google wins over Apple this year (one of my predictions from last week as you may recall). Other notes about the phone: It’s slick, literally. It’s covered in Gorilla glass that gives it a great feel, but it will drop out of your hands if you are not careful. The Nexus 4 is still in limited release, and when I got mine, protective cases were backlogged. Not anymore. But in the past month I did manage to crack the back glass, obscuring the otherwise excellent camera lens. It was not easy to figure out how to replace the cracked glass (an entire ecosystem has already developed around Apple’s similar problem, our family has probably cracked half a dozen iPhones in the past few years). I ended up getting a new phone from a colleague at Google – not service I expect your average consumer is going to get, I will admit. I expect one of Google’s major challenges this year will be customer service. It’s not obvious, from the evidence, if Google is really going to lean into being a hardware servicing company. Once you do get a new phone, the magic of Google’s cloud approach shines through. When you fire up a new device, nearly everything you had already installed on your previous phone just automagically shows up again – because it’s all stored on Google’s servers. All I had to do was reset my mail accounts and re-enter my passwords for my favorite apps, and I was good to go. From what I have heard from those who use Apple’s iCloud services, it’s not that easy over in iOS land. I don’t have experience with iCloud, because I don’t like Apple’s approach (it seems hell bent on figuring out ways to lock you in and start charging you), but my wife is an iPhone user who has had nothing but pain moving from one iPhone to the next using the service. Google’s approach is free, easy, and it’s covered under a far more liberal data philosophy (I’ve written about that in The Nexus 7 and The Cloud Commit Conundrum: Google Wins).The key to it all working is to have a single Gmail account, it seems, which I have now. Google has definitely falled down on this point in the past – I still have phantom Gmail accounts lurking out there that are not connected to anything, but seemed important to create for some reason or other in the past. Connecting all your points of contact with Google – Calendar, Docs, Picasa, Google+, etc. – is still sort of confusing. I’m uncertain, for example, how to get the right pictures onto my phone, as Google seems to automatically favor Google+ galleries, but I am uncomfortable uploading pictures there as I don’t know how they might be seen by others. Thanks in part to the torture of working with the calendar and contact applications native to Macintosh and iOS, I’ve recently migrated to Google Calendar and contacts. I cannot report that these are perfect solutions, but as I start to depend on them exclusively, I am learning their quirks, and finding they work fine. I’m still figuring out the contacts piece. I have more than 10,000 contacts and they are a mess. I am uncertain how best to clean them up – in particular, where to put the energy. Right now I am still connecting my old Outlook system to Apple contacts on the Mac via Plaxo, and then updating Google contacts via the Apple contacts. Google maintains a copy of the mess in its cloud, but I’ve not tried to clean that copy up, because I fear it will just be repopulated with bad data from Apple or Plaxo. In short, I am still treading water in this department. Any and all suggestions gladly taken. I wish someone would fix this once and for all. 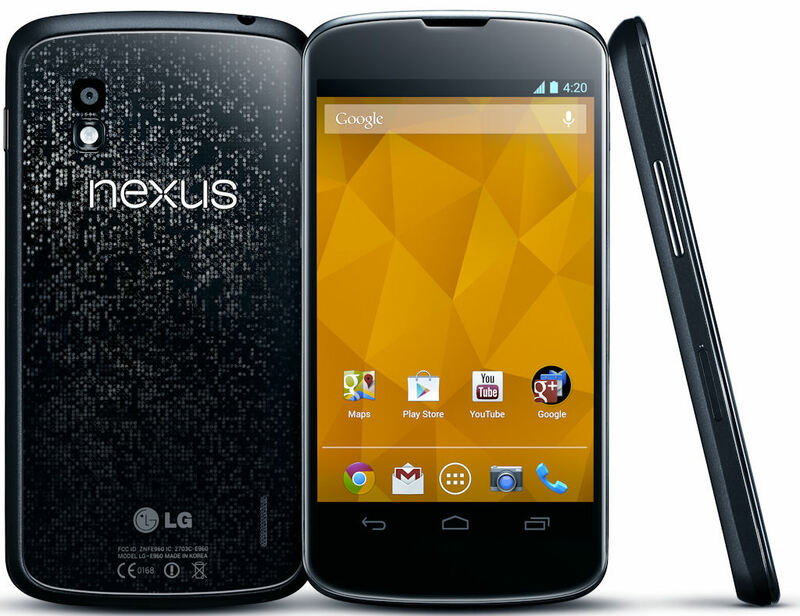 Now, a phone is supposed to in fact be a phone, and in that department the Nexus 4 is fine. It’s not better or worse, just fine. It has some hitches in the OS, but nothing worth writing home about. It does run hot, but it also runs very, very fast. I remember testing a Galaxy 2 that was really slow feeling. This phone is far superior.It’s also way faster than my iPhone 4, but that’s to be expected, it’s a newer model. I have a lot more to learn about the Nexus and its Android environment. I don’t like endlessly futzing with my phone, so I haven’t really tricked it out yet. I have all the apps I used on my iPhone installed, and they all work fine. One irritation: One app that I paid for on the iPhone (a GPS tracker for rides and runs) does not acknowledge the paid relationship for its Android version, forcing me to pay again for the new platform. That’s just wrong, IMHO, but it’s not the fault of Android or Google. The Nexus 4 is a “pure” Google phone – it’s made by LG, but it’s unlocked (I just popped in my AT&T sim from my old iPhone) and the software is all Google driven. It’s in limited production – I understand it’s been in and out of stock in Google’s store. Right now, it’s sold out. That’s a problem, or perhaps, that’s Google’s plan. Either way, it can’t yet be seen as a direct competitor to Apple – it’s not available at scale. But given my experience anyway, I think it should be soon. I dig the device and don’t miss the iPhone at all. So far, so good. Would love to see a follow on post on how to deal with the contacts if you ever find out… While I haven’t got 10000 , I do have over 1000 and would love to know how to only sync certain groups. After all I know a few people online, but to be fair, doubt that I will ever contact them by text or voice .. Great article! Photos that are automatically uploaded to Google Plus are stored in a private folder. No one can see them until you share them. I know, but I want to add more photos that I did not take on my phone, but have on my computer (in iPhoto). Have not figured out how to do that (haven’t really tried to be honest). It works nearly the same way, only you have to manually upload them from your computer. Photos are always private until you share them. Just go into Google Plus, open your photos tab, and click upload new photos, then select the photos you want to upload from the files on your computer. Got it. Done. A little confused by the tagging interface and the demand for sharing – there’s no “I don’t want to share this” button. So I uploaded the same album three times before I realized the first time took. you can also install picasa 3 to upload all photos on your computer. I did. But somehow it isn’t doing it. Ever tried My Tracks from Google? It’s one of those 20 % projects, I suppose, and it reeks with under-appreciation from the dev team – but it records your route, height, speed and has built-in functionality to save a track to your personal Maps. Nope, had not heard of it. Thanks! Having been forced to make the switch a couple years ago from the world of Apple (due to the abysmal cell service at the time from the, ahem, exclusive provider…) to Android, I haven’t looked back, though I complained loudly at the time. I am now pretty fully integrated (like the Borg) although have the same concerns over photos. In importing contacts or dealing with massive batches of duplicates, I used the “find and merge duplicates” option. There is also an app that will fix any messed up numbers and prefixes as I am OCD about how they look. While I have multiple Google accounts synced on this phone (a Note II), I’ve only selected contacts from one to show up. Thanks. Where is this ‘find and merge’ option? You just made me happy…I accidentally deleted a contact that had over 10 numbers in it…saw this and restore it just peachy…awesome. I will check it out thanks! +1 for scrubbly + cobookapp.com – though cobook is only iPhone/mac for now, Android to follow soon I hope. I recommend the app: Gesture Search. It is one of the most underrated of Google’s apps. It allows you to quickly lookup a contact with a graffiti like method of entry. Just for privacy reasons – why do I have to load up all my data to “Big G” first way? I’d really appreciate some sort of open sourced software acting as my own data backend center. Horde.org, for example, are doing fine for mail and contacts, but I still have to figure out their way of handling calendar data. After your post last week I just started thinking more and more how challenged Apple is going to be without some crazy outer-space innovation. Prime-time Apple ads for features such as auto-adjusting volume levels, headphone shape and do not disturb really are somewhat disturbing in their lack of importance. Before those you had celebrities asking Siri banal question (what’s the weather?). Pretty dismal stuff. Google has so much momentum, yet has barely scratched the surface of integrating the back-end. That momentum has to accelerate… and the scary thing is that Apple has no back-end to integrate! Perhaps, paradoxically, that is Apple’s opportunity – to provide openness on the back-end by surfacing third party contributions better in the front-end. Passbook is a perfect example. While Google Now is proprietary to Google, Passbook passes can be created by anyone. Unless Google decides to open up the knowledge graph et al to third party developers, then probably Apple’s only opportunity to really compete is through active investment in compelling UI technologies that harness third party back-ends. OTOH, that’s not really in Apple’s DNA… kind of a head-scratcher. We have your opinion on Apple lock in. Do you have any advice for Google users concerned with google’s commitment to gathering and selling their privacy to the highest bidder or Google’s recent change in shopping search advertising? I am not convinced Google is selling your privacy to the highest bidder. Your aggregated data (and double hashed cookie iD) to the highest bidding advertiser? Yes. First, from one iPhone convert to another: congrats! I’m now “all in” with Google (for better or worse). Android phones, all files in Drive cloud, all music synced to Play, G+ for photos, Chrome tablet for kids, etc. RE. your keyboard: Swype is great, but I recommend SwiftKey; I found the predictive ability more accurate. Gotta love the “open market”, but I’m worried about potential virus/malware issues in the future. Yep. Good luck if you break one. Pretty much nothing you can do now if you aren’t privileged. I’ve had no look repairing my Nexus 4 going on a month now. I would never recommend one to anyone. No luck not no look. Doh! Quote: “one irritation:” You do realize, software companies have different teams and resources for application development on different platforms. which means separate costs of development for separatae platforms. So i support that they get paid for it. But with that said, in the interest of customer loyalty, i do wish the companies would offer a discount to a user who has already paid for an application on another platform. let me now your lastest idea abt that .. any specific problem ????? plz share with me , Or any more sugestion ? I just picked up the Nexus 4 Last week and I say go for it. I’ve had/ had experiences with the iPhones from the first generation all the way up. I’ve also had a Samsung infuse which ran a older version of a custom ROM Gingerbread Android and I can honestly say I’m impressed hands down with the Nexus 4 especially in relationship to the iPhone 5. Both are great devices but my preference is the Nexus 4. My only complaint regarding the phone is the Battery. It’s my recommendation to drop the brightness low and only raise it when it’s required. The phone if you enable it does a lot of Google syncing both over wifi and cellular but the battery loss I’ve found is absolutely minimal compared to the screens use of the battery when the screen is bright. I was concerned with the speaker quality as a lot of reviews I read commented on a weak speaker but I find the speaker to be very good. Sure it doesn’t compare to the HTC One dual mounted front speakers but it’s still impressive for a back mounted speaker. I also read reviews of throttling issues concerning intensive game play but I don’t play games so the phone runs rather cool for me. Next Next post: Phones! Now With Multitasking! Why Mobile Is About To Have Its Web Revolution.